DJ SPARX is far beyond an energetic DJ - earning industry accolades and having worked with some of the biggest names in the business. He effortlessly spins through countless styles of music from several decades with heart pounding energy. 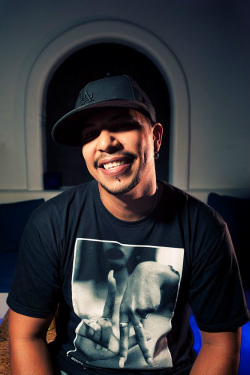 DJ Sparx will give your dance floor a plethora of energized beats ranging from Hip Hop, House and everything in between. This DJ evokes a dance vibe like no other often outsweating the most zealous of dancers just a few feet away as he weaves in and out of the hits and more. DJ Sparx went from B-Boy to DJ in the early 90’s while living in the Central Coast of California. His diverse musical palate developed from family, friends and travels where he experienced a variety of musical styles and artists. Sparx quickly began playing parties where he began to showcase his raw talent for exuding energy onto dance floors. His humble beginnings have lead him to playing an average of 250 + events a year and some of the biggest Electronic Music Events nationwide that include DJs such as, DJ Sneak, DJ Heather, Mark Farina, Donald Glaude and many, many more. Sparx is also a part of a duo that includes Vegas based Vibe Elevator Rico DeLargo on the trumpet. DJ Sparx is now turning heads at every event he spins - weddings, corporate parties, school dances, and more - with his flawless transitioning between styles, and professional MC abilities. Book DJ Sparx, an amazing talent and party rocker for your event now!